Every morning the trattoria is open (every day except Sundays and holidays), the first thing Mirella and Marco do is go to the supermarket to buy produce, bread, meat, and any other ingredients they need for the day. Instead of buying large quantities and sticking them in storage, they buy just what is needed (or a bit extra), to make sure everything is fresh (and to waste less). I tag along to learn what I can about how to select quality ingredients, and because we stop to get colazione (breakfast) on the way back to the trattoria. My favorite part of the market is the produce section, a rainbow of bright colors. Seeing the green tomatoes for sale was surprising the first time I saw them. I have since learned they are tangy but tasty. 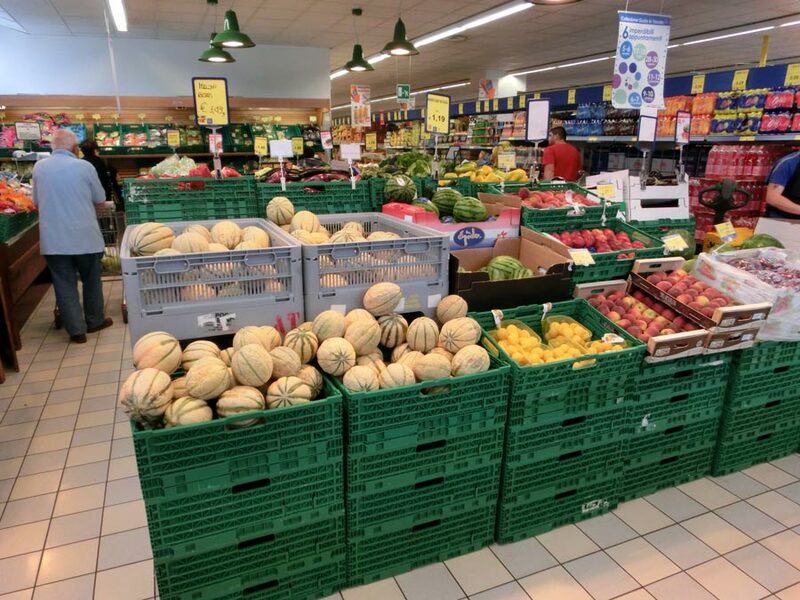 Most of the produce at the supermarket comes from Italy, though there is some fruit that is imported from other European countries, especially Spain. Marco and Mirella check the labels carefully and only pick Italian fruits and vegetables. Some of the red peppers are nearly as big as my head. The aisles are narrow, so most people park their carts to one side and carry the fruits and vegetables over to them. If you're not paying attention, it is easy to put something into the wrong cart, as I did when I unknowingly put a kilogram of cherries (from Sicily) into a stranger's cart. When Marco informed me of my mistake, I rushed to correct the situation, managing to turn a minor mishap into a mess. In my haste, I grabbed the clamshell of cherries with one hand, which popped open as I picked it up. Half the cherries poured out, into the cart and onto the floor (in the aisle where everyone who comes into the store passes through, no less). I dropped to my hands and knees, scooping up cherries as quickly as I could, feeling like a klutz. (Have you ever tried to pull cherries out of the metal wicker of a shopping cart without mashing them? It's not so easy.) So much for being inconspicuous. An embarrassing incident, but I did learn an important lesson: Keep your eyes on the cart and both hands on the cherries.